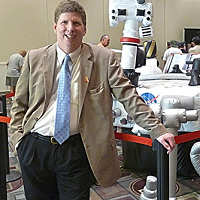 Chris Carberry, CEO and co-founder of Explore Mars, will give a plenary talk on “Creating a unified campaign for Mars” at the 19th Annual International Mars Society Convention, scheduled for September 22-25 at the Catholic University of America in Washington, D.C. In his role with Explore Mars, Mr. Carberry has led successful international conferences including the ISS & Mars Conference in Washington, D.C. and Strasbourg, France, and the Women & Mars Conference also in the U.S. capitol. He is considered a well-respected expert and influential director of strategic alliances in the space community and has been responsible for growing many partnerships for leading industry organizations. Mr. Carberry also currently serves as Chairman of the Steering Committee for the Space Exploration Alliance (SEA). Prior to joining Explore Mars, he served as Executive Director of the Mars Society and was a member of the organization’s Steering Committee. Full details about the 2016 Mars Society Convention are currently available online, including how to register, the list of confirmed speakers and opportunities for volunteers. The convention’s full program itinerary will be posted on the Mars Society web site next week.